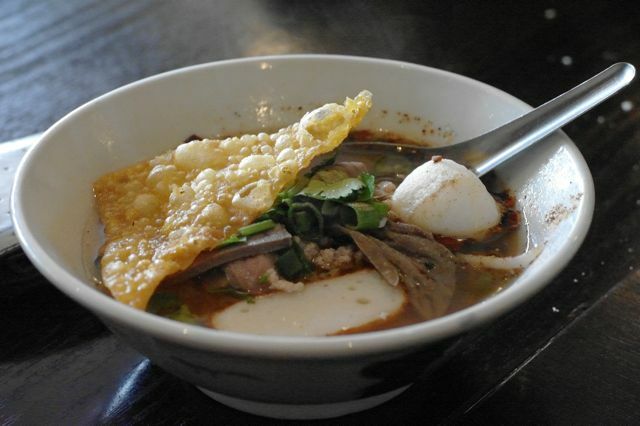 Are you mad for Thai noodle soup? No??? Well move along please nothing to see here. 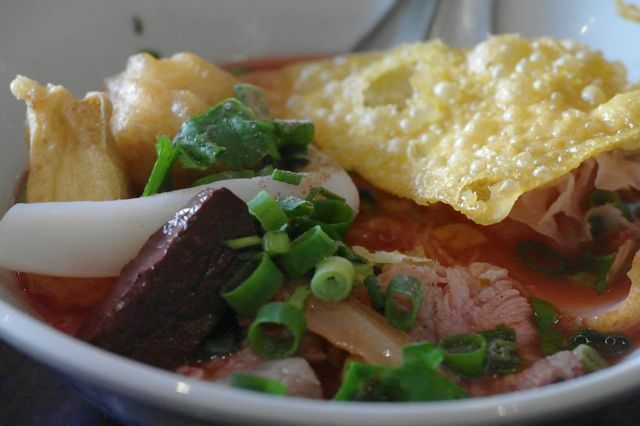 If you're still here I can safely assume that you are like me and love Thai noodle soups or at least are interested in learning more about these amazing creations. 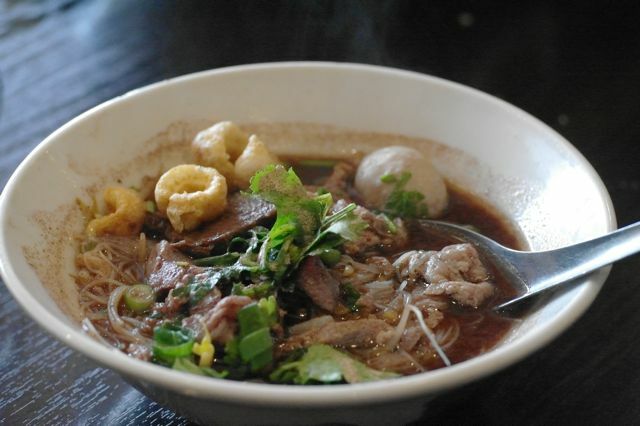 Lovers of Thai noodle soup need look no further than Krua Thai 2. I was directed to Krua Thai 2 by Khun Top of Tidlom Thai Antique who credits Krua Thai 2 (and his mother) with teaching him all he knows about Thai food, and that's a lot. 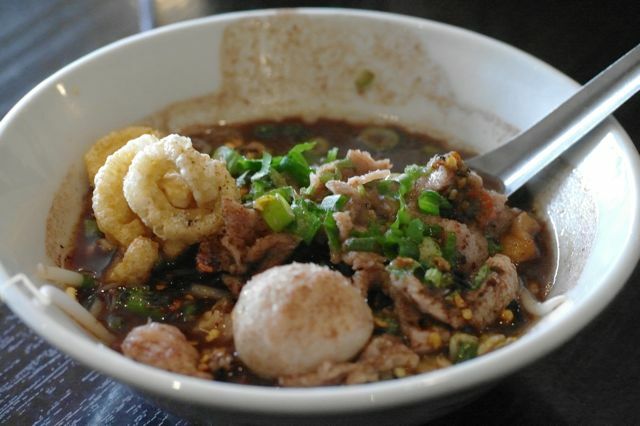 As with most times when I talk about food to Thai chefs we invariably end up talking about Thai noodle soups and in particular where the best examples can be found in Melbourne. Most (well pretty much all) Thai restaurants that offer more than the standard Tom Yam Goong use a packet powder or bottle paste base to construct their soups which although often delicious leaves the final product a far cry from what you will taste when in Thailand. Only on Saturday and Sunday at Krua Thai 2 you can get a great array of traditional Thai noodle soups, all of which are made from scratch. Even better, you can get small size servings for only $6 a bowl which means you can comfortably try out a number of the options available (if not all). We managed 5 bowls and will certainly be back to have them all again and try the rest, including the dry variations. 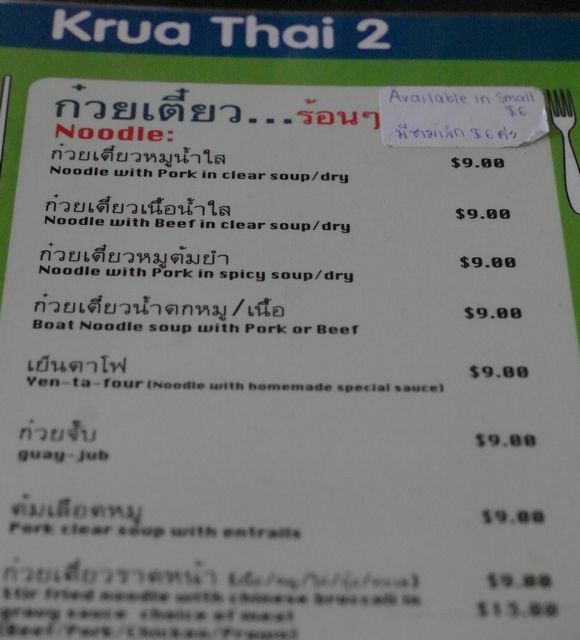 As far as I'm concerned, the list above is pretty much the greatest hits of Thai noodle soups. First up was the Kuay Tiao Rua Nua (Beef Boat Noodles) with Sen Mee (Rice Vermicelli) noodles. I've read that anyone who knows what they're doing would never order Boat Noodles with anything but Sen Mee so as I like to pretend that I know my stuff that's what I ordered. This dish was just sublime and easily the best version of Boat Noodles I have tried outside of Thailand. I could have ordered a second bowl straight up but wanted to save room for as many of the greatest hits as possible. Next was the Guay Jub which I have also had previously but again this version was far superior. It's an interesting dish as the noodles are little flattened discs that are rolled into tubes and cooked until beautiful and tender. Unfortunately my photo doesn't quite show them up so you'll just have to get over to Krua Thai 2 to try them for yourself. This dish contained a number of different proteins, some of them gorgeously tender and some not so easily discernible but all of them superb. Once again the broth was sublime, which was actually the case with all the soup noodles we ate at Krua Thai 2. Being a Boat Noodle tragic I had to try both the pork and the beef variations, I couldn't say which I preferred as they were both just amazing. I'm in the process of refining my own Boat Noodle recipe for our soon to be launched Thai Street Food Cart so while our visit to Krua Thai 2 was about enjoying their amazing noodle soups it was also about research. I have to say I was actually a bit intimidated by the quality of the broths in particular but I'm hoping with a bit more work I can produce something that is at least comparable. It is certainly the level that I aspire to reach. 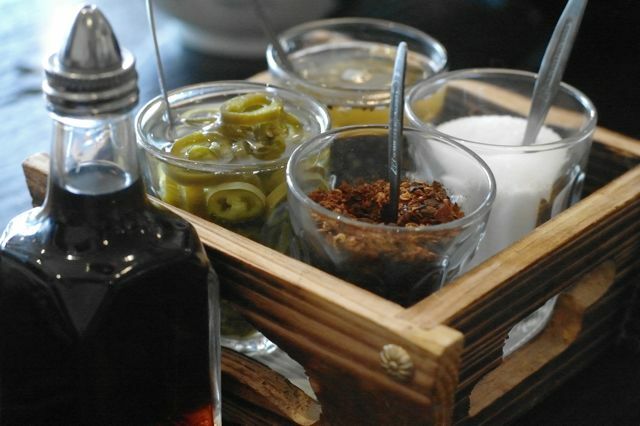 Standard condiments are provided on all the tables, fish sauce, white sugar, crushed dried chillies and two variations of chillies in vinegar. The Krua Thai 2 broths were all wonderful without any seasoning but the addition of a touch of this and a splash of that can take them to another level. I definitely encourage you to have a bit of an experiment but be careful with the dry chilli as it really packs a punch. I don't mind Yen Ta Four and have tried it a few times, it's such a confronting bright pink colour which I believe is produced from some kind of fermented soy bean although more commonly a colouring sauce is used. 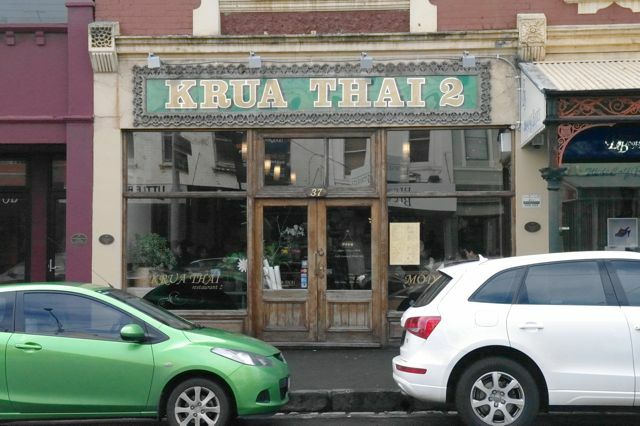 I couldn't say which approach Krua Thai 2 use but judging by the authenticity of the other dishes we tried I suspect it is probably the former. Another unusual aspect of this dish is that it contains seafood with fish cakes and squid but also pork and blood cubes, not a combination you see very often. 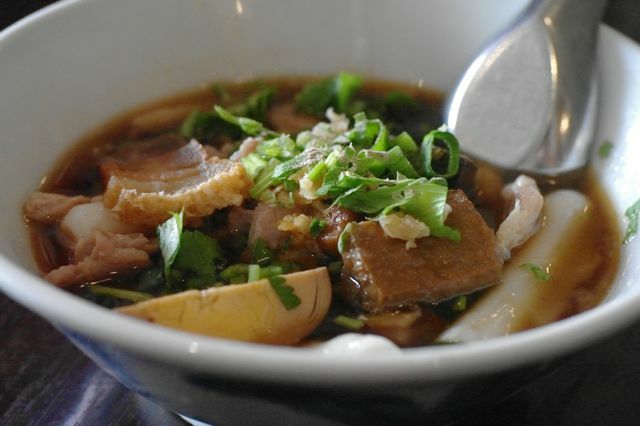 Yen Ta Four has an interesting and not particularly confronting taste though so don't be intimidated to give it a go. 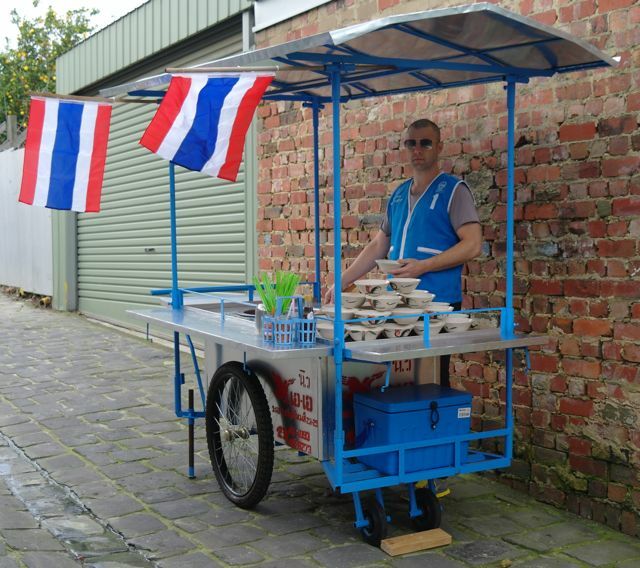 As I mentioned above I am currently working on putting the finishing touches on my Boat Noodle Soup recipe and subject to permit applications and other red tape I am very hopeful that we'll be launching our Thai Street Food Cart at the North Melbourne Spring Fling on 21 October. In addition to Boat Noodles, Tina will be making Thai style Dorayaki and judging by the ones she has made so far I reckon they're going to be a hit. Hope you can make it!